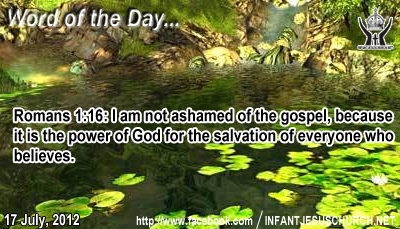 Heavenly Father, make us more bold to proclaim the Gospel today. Give us eyes to see those who are waiting to be told. Fill us up with your Spirit so that we will not be embarrassed but will gladly proclaim the story of Infant Jesus. Fill us life with the optimistic hope of Jesus' glorious and winning return so that we might share it with passion and others will know of your grace. In the name of Infant Jesus we pray. Amen. Jesus did mighty works to demonstrate the people how much God had for them. Chorazin and Bethsaida had been sanctified by the visitation of God. They heard the good news and experienced the magnificent works which Jesus did for them. Why was Jesus distress with these communities? The word woe can mean bad luck, calamity, distress, sorrow, sadness, misery, sorrow, or wretchedness. It is as much an expression of sad, pity and grief as it is of dismay over the disaster and destruction which comes as a result of human folly, sin, and unawareness. Jesus' anger is directed to sin and everything which hinder us from doing the will of God. In love he calls us to walk in his way of truth and liberty, grace and loving-kindness, justice and sanctity. Do we receive his word with faith and respect or with doubt and indifference?